Brahmas are gentle giants with feathered legs and feet---and profuse, fluffy feathering. Originally from India, these birds were developed for meat production, but are too slow growing to be regarded as "meat birds" today. The hens lay decent numbers of eggs, and are great setters and mothers. 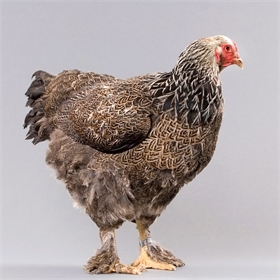 The dark variety of Brahma is not black, as you might think from the name. In actuality, from a distance the Dark Brahmas have a warm, medium grey appearance with black hackles shading to silver and white at the head. But close up, those steel grey feathers are intricately penciled in black---truly magnificent! Brahmas are BIG birds. 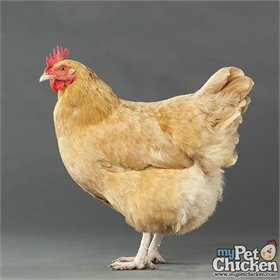 They're so much larger than most other breeds that they may end up near the top of your pecking order by default. 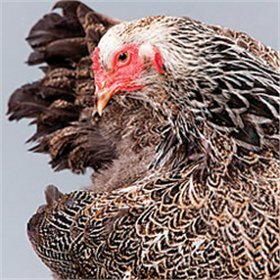 The other thing to remember about their size is that you should gather eggs frequently and make sure your hens have supplemental calcium to develop strong shells. Weak-shelled eggs left too long in the coop can get inadvertently broken. That's a danger with any breed, of course, but particularly so with extra large birds like Brahmas. Brahmas are so gentle, and make great pets. They are quiet, cold tolerant, and absolutely huggable! While not a power layer, you can expect three or so medium-size brown eggs from this bird per week.